Model ME81 is Miracle's newest Stainless Steel Bowl Rice Cooker. The same extraordinary rice cooker as the ME8, but now the vegetable steamer tray is also stainless steel! 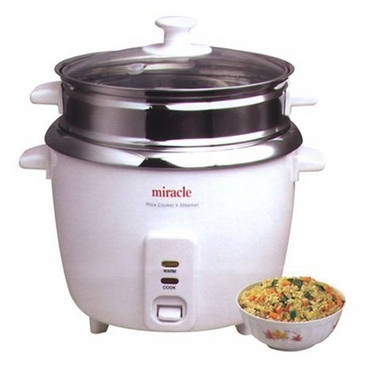 The new Miracle rice cooker is an incredible 8 cup (uncooked) rice (and quinoa) cooker that will yield a full 12 cups of cooked white or brown rice. Cooks rice automatically and then switches to a stay warm mode when rice is fully cooked, keeping rice warm for hours. The inner cooking bowl is a beautiful solid mirror finish stainless steel - 304 Stainless Steel (no PTFE or other non-stick surface). The glass lid allows you to view the rice or vegetables while cooking and the easy view indicator lights identify cooking modes. Also comes with a stainless steel vegetable steamer tray (pictured above with lid resting on it), measuring cup and rice paddle. The inner stainless steel rice cooking bowl is constructed of solid 304 stainless steel which is the equivalent of 18/8 stainless steel, and is removable for easy cleaning. The vegetable steamer tray is solid 430 stainless steel. Your rice only comes in contact with the stainless steel cooking surface for added health benefits. I love this rice cooker because it is stainless steel construction. I searched for a long time to find a rice cooker that had no plastic coming in contact with my food. This product works great for a steamer. In fact, I use it almost daily to steam veggies. I have used it for several years and love it! Read the review all the way through I like the steel for my health,. Non-stick is toxic. While this cooker is stainless steel and is easy to clean, it shows signs of being cheaply made. There is a aluminum screw that holds the lid handle on, as you know, aluminum is toxic, and being out of the way probably doesn't hurt anything, but it does reflect the attitude of the manufacturer. you have to experiment with the water amount. I use brown rice and I use 2 cups of rice to 5 cups of water and it comes out perfect every time. I refrigerate what is left over and it keeps fine. The rice is very hot when finished, be careful, I let it cool down so it doesn't melt plastic storage containers. The other feature that shows cutting corners on quality is the is in the bottom of the metal rice cooker pan there is appearing 2 bubbles in the metal, about 1/4 in. or so showing tiny cracks which appeared after a few years. You may think I am being picky, but I am afraid the metal will eventually give out. I the manufacturer took care of these flaws you probably would have a lifetime rice cooker. I have used my cooker for probably 8 to ten years and it works great. Play with the amount of water to extend or decrease the cooking time and you will get what you want with basically a fine rice cooker. I have always made rice stove top in a pan so I didn't know what would be so different about a rice maker; however, my son likes to make a lot of brown rice, so I basically bought it for him. He loves the way the rice turns out, just right. When we made it on the stove top, it was always just a little crunchy still. Now, it's perfect. Thank you!! !